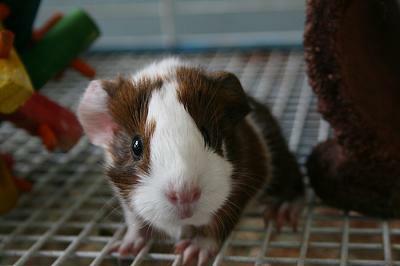 One day I asked my mom and dad, "Can I have a guinea pig?" Mom said, "Me and your father will think about it." My father had always been against letting me get one because he thought I wouldn't take care of it. I was out to prove him wrong. I walked to my room I said, "Oh boy maybe I will get a guinea pig. I've wanted one for a long time!" I walked over to my TV and looked at the black broken screen. "I wouldn't need a new TV if I had a guinea pig." I spent five months proving to my daddy that I was responsible by taking care of our two dogs. After all those months passed I asked again, "Now can I have a guniea pig?" Mom said, "Your father said yes." So I ran into my room and got out all my money I had saved. "One hundred dollars even!" I ran downstairs and said "Lets go!" Mom and I got in the car and she said, "We are going to get it at Animal Attraction." I said, "YAY!! I've been waiting a long, long time for this." I walked into the store. I had been in there a so many times to look at the guinea pigs. I went right to where they were kept and looked in the cage. "Ohhhh mom, look babies," I said pointing to the baby guinea pigs. "I want that one," pointing to the littlest one. The store owner said "Ok." and took her out and put her in my hands. "Here you go." Mom and I went right to the car and got in. Mom said, "Ohhh honey how cute. I sure hope the dogs don't eat it!" I got a scary feeling in my tummy. We drove to Petco and got a cage, food, bedding, water bottle, food dish, and more. We went home and Dad was sitting at the table. I ran over to him and said, "Thank you, thank you, thank you, sooo much!" I put the guinea pig in the cage for a moment and flung my arms around my daddy. "Thank you!" I said again. He put his big arms around me and said "Honey, I love you, and I am proud of you for showing how responsible you can be. Enjoy her and take good care of her." I ran right to the cage and took the guinea pig out so I could put bedding in and a full water bottle and food. The dogs came running up and sniffed the animal. I said, "NO THIS IS NOT FOR YOU!" I placed the animal safely inside the cage. She ran right inside the igloo. I put the cage in my room and shut the door firmly. Only then did I take her out. I put her in my hands and she cooed as I pet her. My brother came and and yelled, "So what are you going to name it?" I said, "I don't know yet." I looked at the fine mixed brown and blonde hairs. I said, "Splash." We all lived peacefully together and the dogs never bothered Splash. This is amazing im showing this to my dad and mom so mabye they will let me get a guniea pig. Just like in the story my parents are still thinking about it. I shure hope they let me.